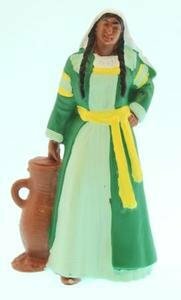 Abish, a converted Lamanite woman, was a faithful servant to King Lamoni. She witnessed Ammon, King Lamoni, the queen and others fall by the power of God. She used this as an opportunity to share her beliefs, testifying of the wondrous workings of the Holy Spirit. Abish ran from house to house telling everyone. The Book of Mormon recounts that as soon as Abish bravely touched the fallen queen’s hand, the queen awoke, testifying of Jesus Christ. We can learn from this powerful woman in Alma Chapter 19! !